I love, love, love this rice bowl. So amazing. You can add edamame if you want - personally, I try to not eat soy - its a GMO thing. Dovetailing Tip: When cutting up the bell peppers for today’s meal, chop up the bell peppers for the salsa for Meal 5. Place the rinsed rice in a rice cooker. Add 3/4 cup coconut milk to the cooker, and 1 1/4 cup water. Turn on to cook. When the rice is done, add the juice of half a lime along with 1/2 cup cilantro. Stir. Heat the oil over medium-high in a large sauté pan. Add the mushrooms and sauté until they become tender and dark brown, about 4 minutes. Add the zucchini and bell pepper; season with salt and pepper and sauté another 3 to 4 minutes. Add the garlic and ginger; saute for another minute. Now add the remaining coconut milk, remaining cilantro, scallions, fish sauce and another good squeeze of lime juice. Let it simmer 3 minutes, or it warms through. Salt and pepper to taste. 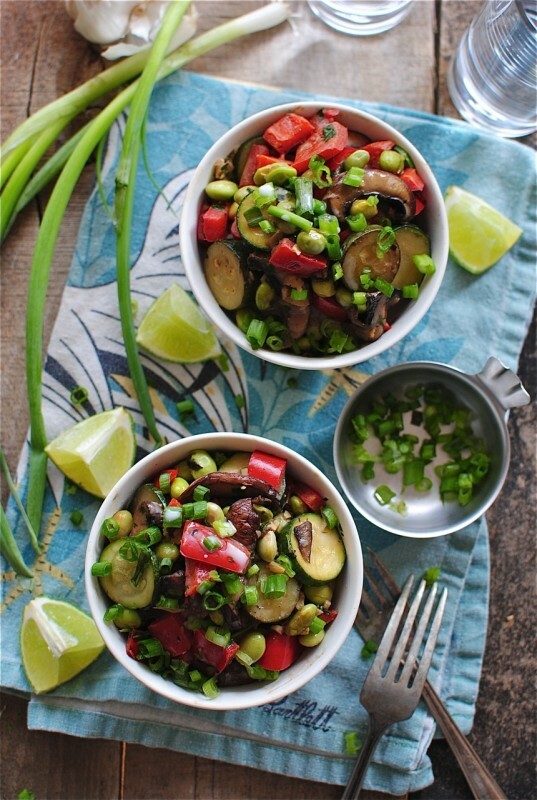 Serve veggies over coconut rice garnished with more scallions and fresh lime wedges!